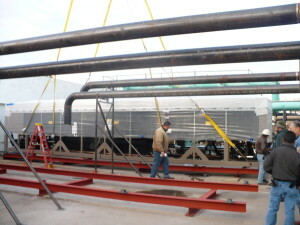 Southwest Mechanical Services offers several highly-specialized repair & retrofit services. These services require unique equipment and/or specialized expertise. 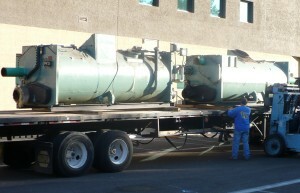 Southwest’s Technicians have a seasoned knowledge of Industrial HVAC applications and Process Chiller systems. Capable of complex HVAC solutions or complete system retrofits, the Southwest team is uniquely equipped to tackle Industrial and Manufacturing HVAC challenges. Magnetic bearing compressors operate more efficiently than typical centrifugal and screw compressors, especially during partial load conditions. The magnetic bearings allow the compressor to operate without the use of oil for lubrication, which reduces energy losses due to friction and increases the heat transfer efficiency of the chiller. Light-weight equipment (200# versus 1,200#) – allows for faster installation. Low power start-up (2 Amps versus 700+ Amps) – reduce peak and capacity power requirements. Energy savings typically range between 30-40%. Utility rebates available to subsidize retrofit costs. In addition to energy savings, magnetic bearing compressors feature many benefits developed through extensive R&D by Turbocor. Turbocor began research and development on a new compressor in 1993. The design goals for developing a centrifugal compressor included lubricant free operation and a direct drive system. One hundred fifty million dollars was invested in R&D of this compressor, the result of that investment is an oil‐free compressor that has magnetic bearings, and a direct drive system with no gears. Additional benefits include a light weight design (80% less than traditional compressors) reduced noise and vibration and only one moving part. By 2001, beta test sites proved the compressor design was viable for market introduction. The compressor’s rotor, permanently magnetized shaft and impellers levitate during compression and float on a magnetic cushion. Two radial and one axial magnetic bearing are employed. The compressor has an integrated variable frequency drive (VFD). VFDs provide the best part load efficiency and operate most effectively with centrifugal compression. The speed of the compressor adjusts to changes in load and/or condenser water temperature. The minimum load on the compressor is 15%. The auto balance feature checks and repositions the magnetic bearing six million times a minute to maintain centered rotation at all times. It uses 1.6 amps to start up (elevate the shaft) and operates at 16,000 to 40,000 RPMs. The motor is a permanent magnet brushless DC motor and the motor, electronics, and VFD is refrigerant cooled. The compressor is designed to handle a power outage. The motor becomes a generator; after the compressor comes to a complete stop the rotor de‐levitates normally onto touchdown bearings. In a chilled-water system a large or multiple compressors are installed in a central location. The compressors provides cooling to a medium such as water, the water is cooled to between 40 and 45 degrees Fahrenheit. The chilled water is then piped throughout the building and connected to air handlers. The warm air in the building is transferred to the water which is cooled again by the compressors and recirculates back to the air handlers to repeat the process. Cascade refrigeration has two or more stages of refrigeration (i.e. two or more cycles) which operate in series. These refrigeration cycles are called cascade refrigeration cycles. Typically cascade systems are employed to obtain high temperature differentials between the heat source and heat sink and are applied for ultra-low temperatures ranging from -70°C to -100°C. Today cascade refrigeration is being utilized in laboratory testing equipment such as chip manufacturers. Analyze anti-friction bearing condition to discern the severity of bearing damage. Detect installation faults such as soft foot. Assist in detecting when failure may occur. Utilize for continuous (real time) machinery condition monitoring.